Completely safe for ALL pets, birds, reptiles and exotics. 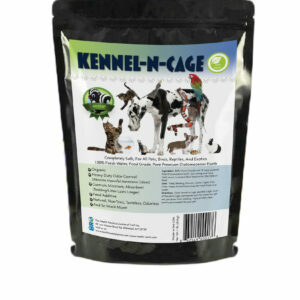 Kennel-N-Cage is a bedding booster, that naturally prolongs and enhances your pets bedding/litter. Keeps bedding dryer-longer, fresher! Easy to use to boost the length between bedding changes, simply sprinkle on bottom of cage or kennel and put dry shavings or bedding over, can also be sprinkled on top of bedding to help reduce odors. Great For Use In Kennels, Litter Boxes, Chicken Coops, Rabbit Hutches, Small Animal Cages, Bird Cages, And Reptile Houses. Diatomaceous Earth is a natural mineral feed additive, add to your pet or birds feed for a healthy coat, bright eyes, and healthy plumage.